My top thirteen books for Halloween, from board to young adult. Dan Yaccarino’s art is bright and bold and features expressive pumpkins, a ghost, a witch and a black cat. 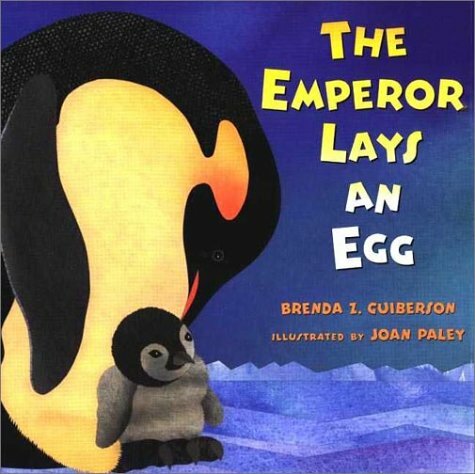 Based on the popular rhyme and finger play, this book offers a great opportunity to learn about colors, expressions and counting to five. 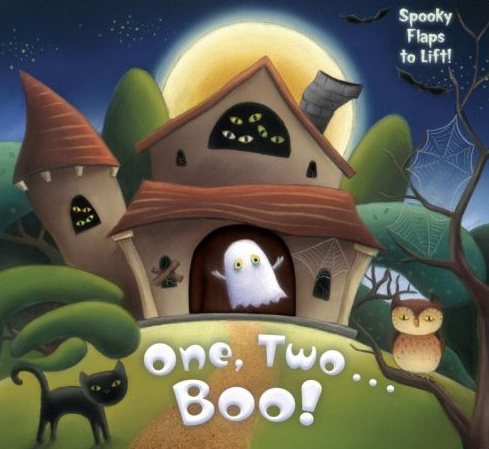 Meet a ghost, a cat and other traditional Halloween characters as you count your way through this lift-the-flap haunted house. 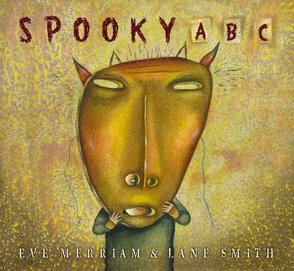 This Halloween themed alphabet book features a varied array of spooky items and creatures. F is for fiend, N is for nightmare, and X is for a xylophone made of bones. 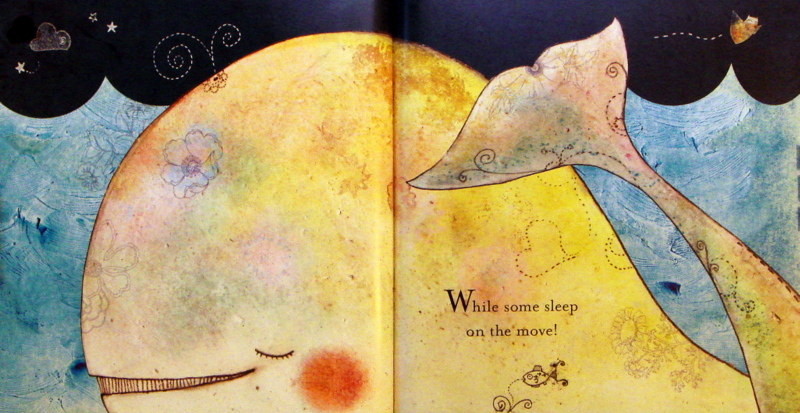 They’re all creepily and perfectly illustrated by the unmistakably talented Lane Smith. 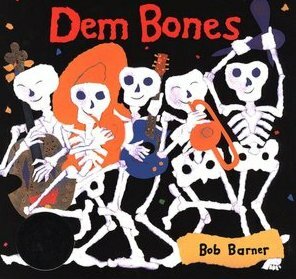 White skeletons, set against bright backgrounds, play instruments while teaching young listeners how all our bones connect. 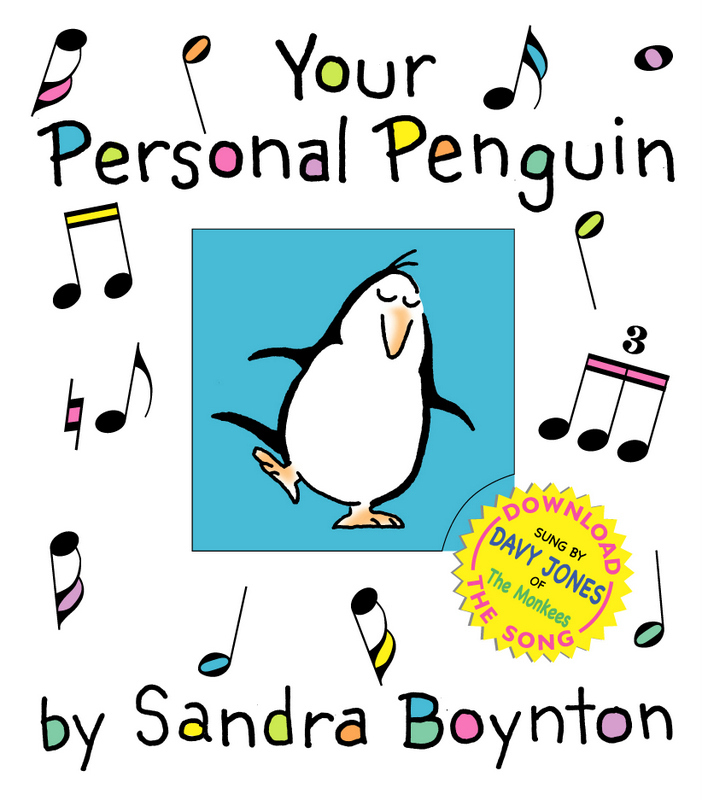 This picture book version of the Bones song features additional information about each of the bones as well. 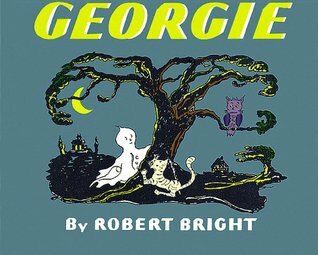 Originally published in 1944, Georgie is not strictly a Halloween book, but it is a great story about a ghost. Every house has a ghost. Georgie loves his house, all its squeaks and its owners. So when some of the squeaks and creaks get fixed, Georgie decides its time to find another house. After searching and searching, Georgie soon realizes he loves his house best. 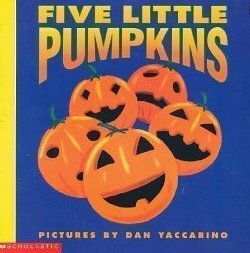 This is one of my favorite Halloween books. Dav Pilkey’s story is sweet and hilarious; his illustrations are colorful, and cartoon-y. The other dogs laugh at Oscar, a dachshund, because he’s so short and long. The teasing gets worse when Oscar’s mother dresses him as a hotdog for Halloween. But it’s Oscar that saves the night after the other dogs are chased into a lake by two mean cats. Roger has a small and very important part in the school’s Halloween play. 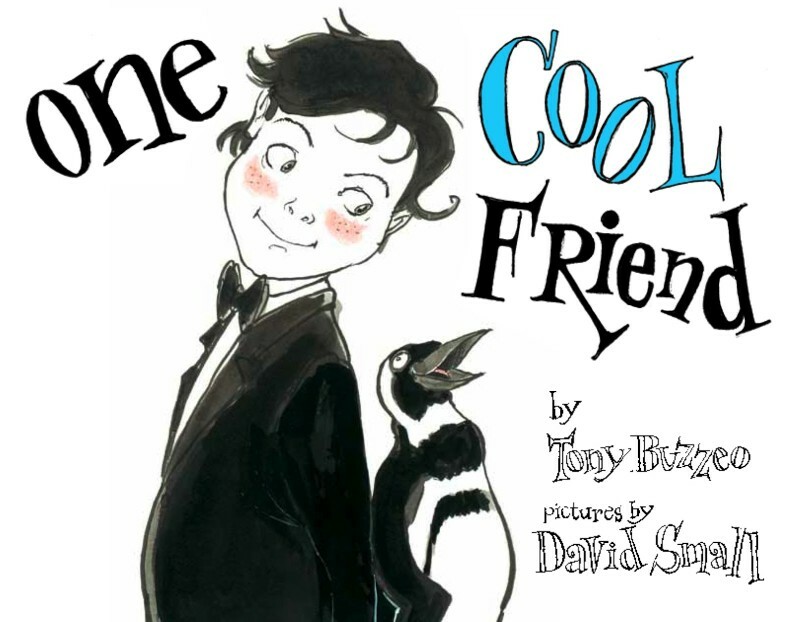 This adorable book follows all the pre-show jitters and anticipation through to the performance and post show excitement. 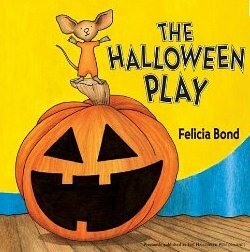 Using warm colors to depict tiny Halloween characters, this book could easily become a year-round favorite. 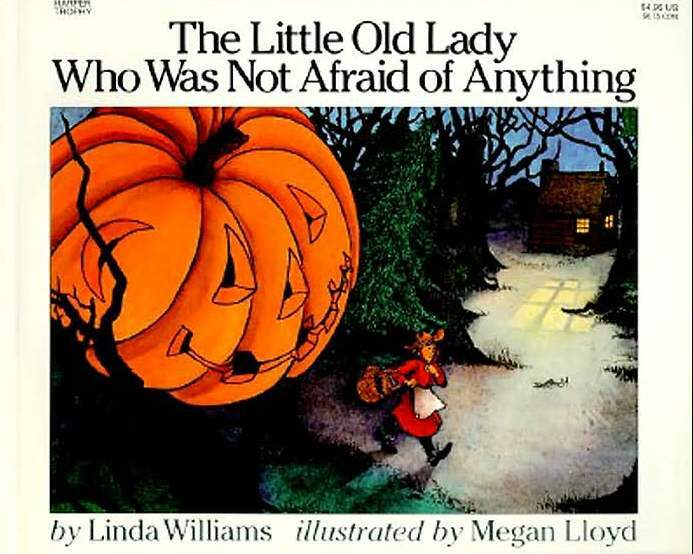 When the little old lady is followed home by an empty pair of shoes, she tells them, “I’m not afraid of you!” Soon a pair of pants, then a shirt, and a pumpkin head joins them, and they’re all following her! The little old lady is still not afraid, and after rounding them all up, she has a lovely scarecrow for her garden. 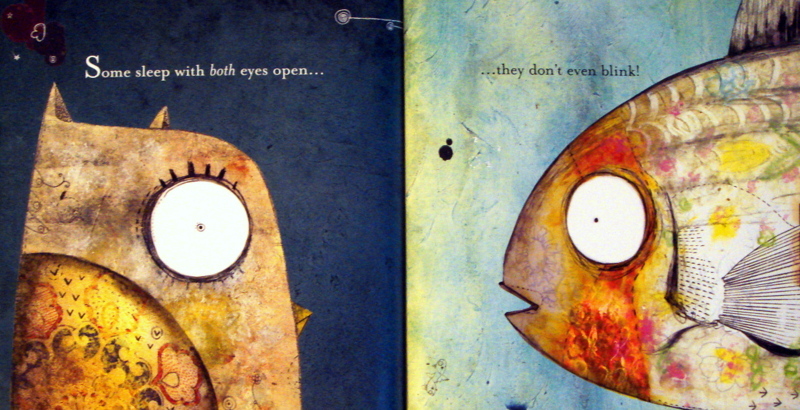 Lloyd’s bright, colorful folk art is a perfect complement to this spooky story with a funny ending. 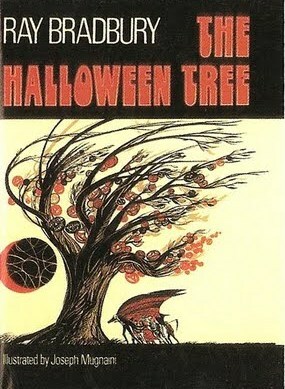 This is another one of my favorite Halloween books. 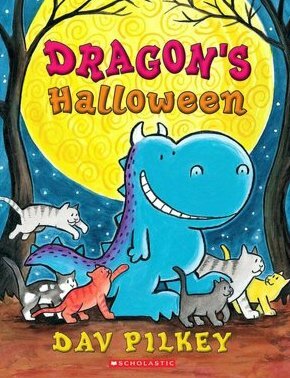 It contains three tales about Dragon and his Halloween adventures: “Six Small Pumpkins,” “The Costume Party” and “The Deep Dark Woods.” Dragon is one of my favorite early reader characters. He’s sweet, funny, adorable and endearing. 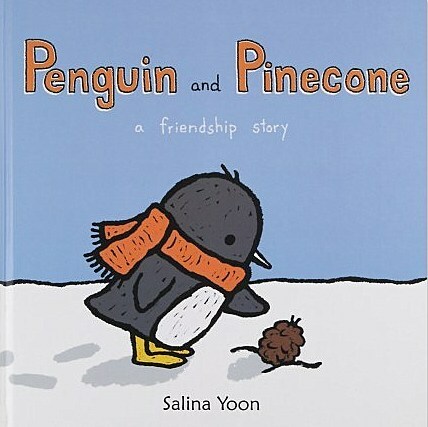 The stories are wonderful and the art is irresistibly delightful. 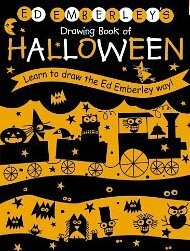 Ed Emberly leads young and aspiring artists, shape by shape, through the steps to drawing spooky characters and scenes. 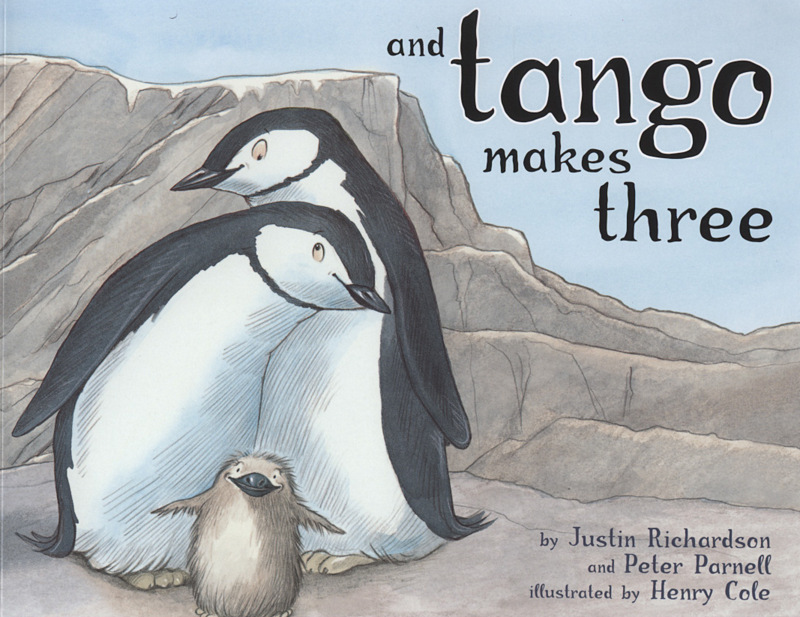 A great book for the family to share. 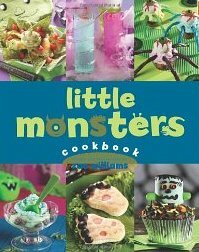 Features thirty recipes for Halloween, or anytime kids want a spooky snack. Some of the recipes are simple and others more complicated to accommodate a range of ages. Large colorful photographs accompany all the recipes in this spiral-bound (genius!) cookbook. 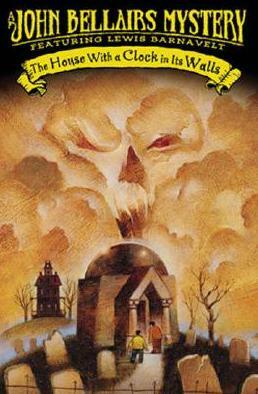 John Bellairs (1938-1991) was an amazing storyteller who wrote adventurous tales of terror. This is the first book in the Lewis Barnavelt series. After Lewis’s parents die, he goes to live with his uncle in an old, large mansion full of secret passageways. The previous owner of the house was an evil wizard who planted a clock inside its walls, counting down to the end of the world. When Lewis accidentally awakens the dead on Halloween night, the clock begins ticking even faster. In this eerie tale set on Halloween, eight costumed boys are lead through time and space by Mr. Moundshroud. 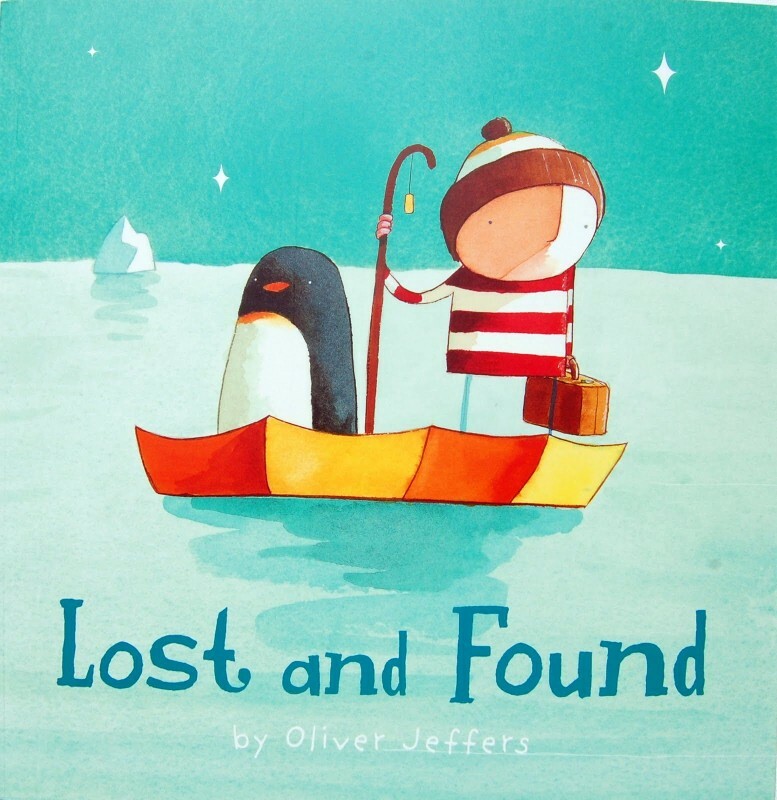 While searching for their friend Pipkin, who was swept up by a dark something, the boys get a glimpse of how other, sometimes ancient, cultures celebrated this time of year. Jamberry: A book you’ll read again and again. 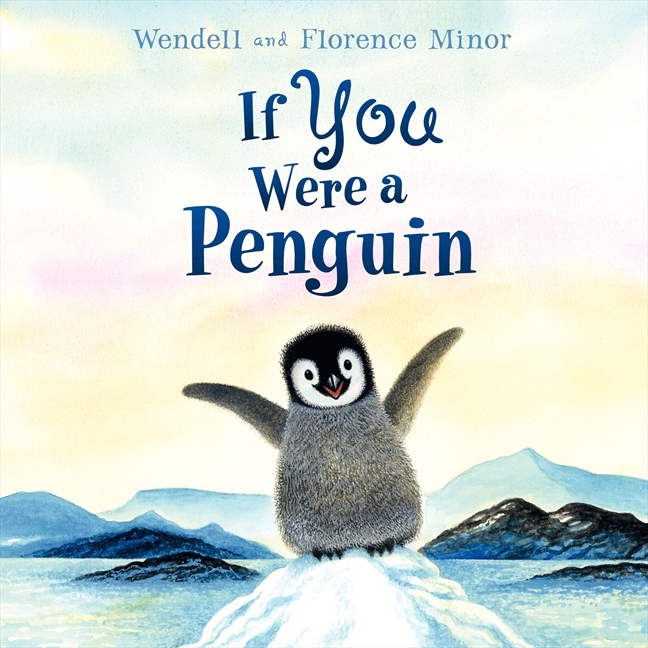 This is a perfect book and holds a permanent spot on “my top twenty books for a baby” list. 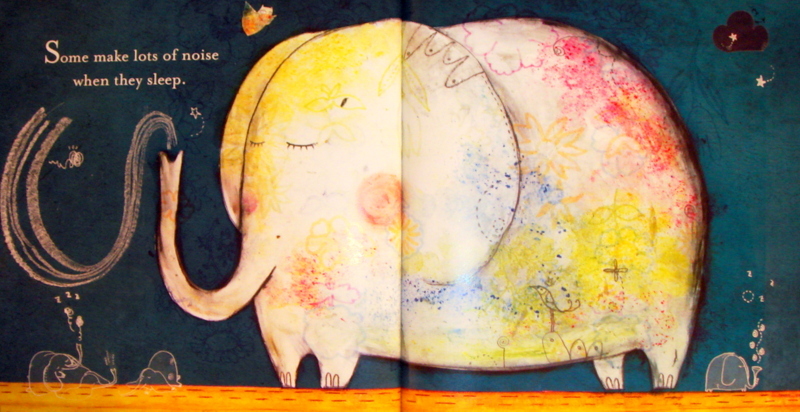 The illustrations are colorful, detailed and whimsical. And there are fun things going on in the background to point out and talk about. 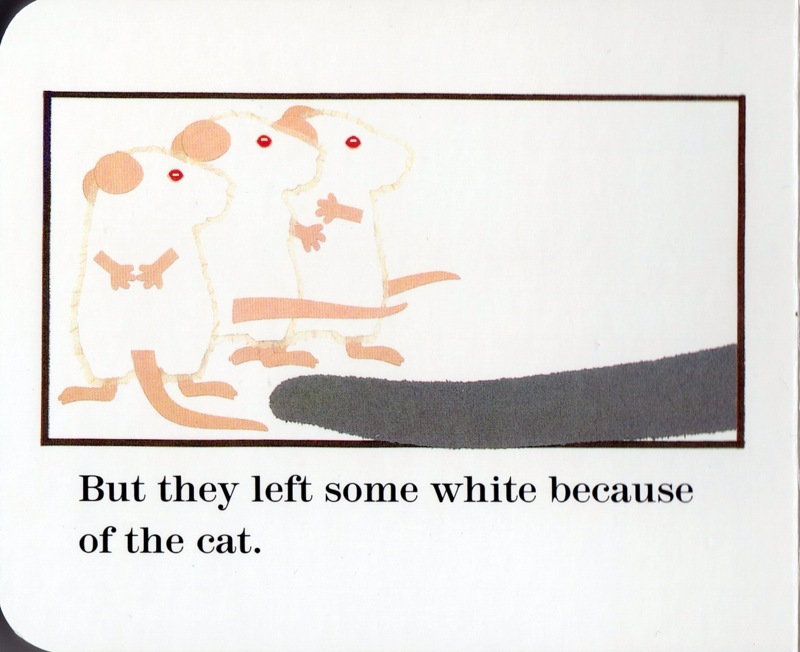 The text has a flawless rhyming pace, making almost any adult feel like the most practiced preschool teacher or librarian while reading it aloud. When there’s a perfect rhythm to follow you can almost sing the words, making it that much more fun to read. 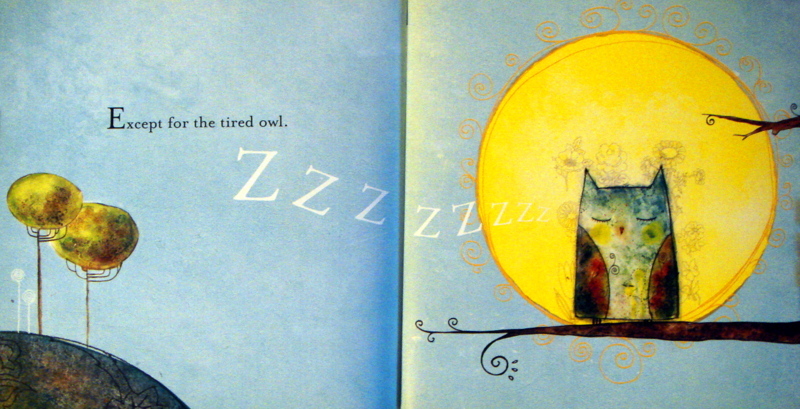 Jamberry is a simple story about a boy and a bear going berry picking and the friends they meet along the way. 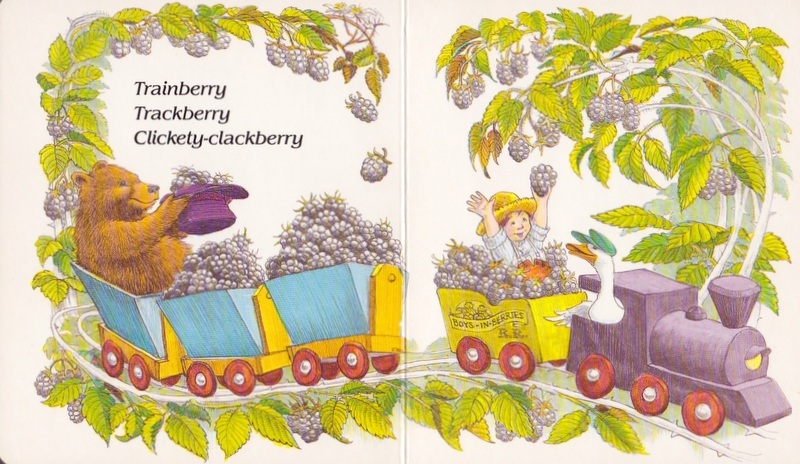 They travel down a river in a canoe, dance in meadows, hop on a train, and take part in a Berryband concert! 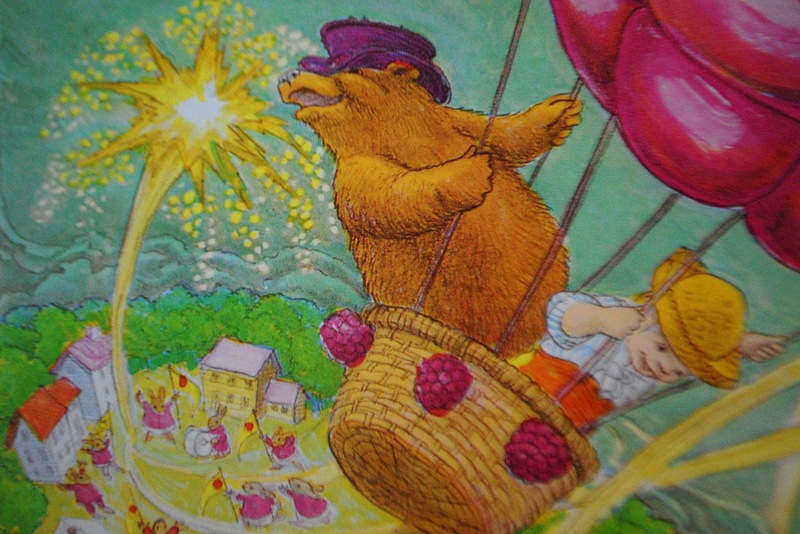 Then, an already perfect day of berry picking and festivities draws to a close with fireworks. 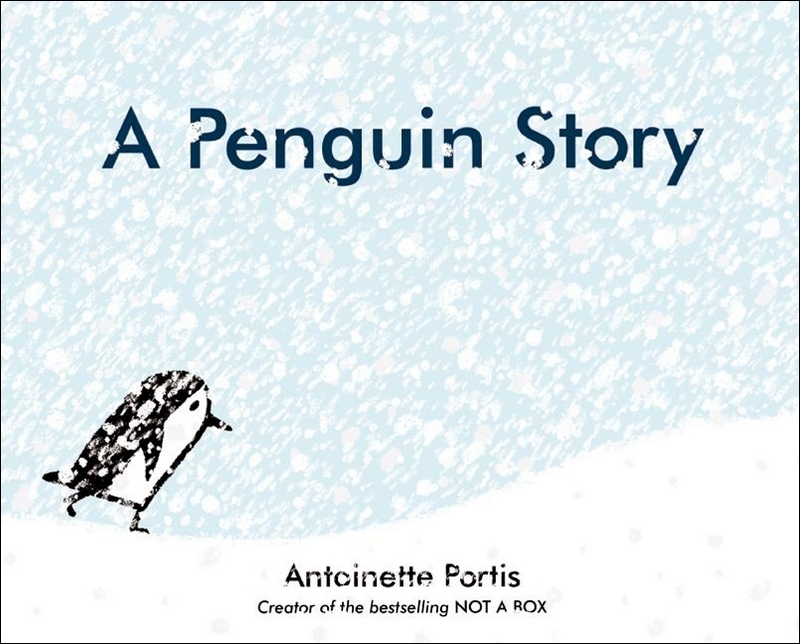 Be prepared—little ones will want to hear this story over and over and over. I am a Bunny: A frolicking bunny in red overalls. 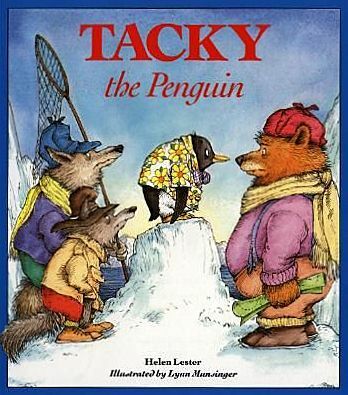 Richard Scarry (rhymes with hairy) is best known for his Busy Town books. In Cars and Trucks and Things That Go he uses animal characters to introduce people and their professions, automobiles, machines, transportation and buildings. 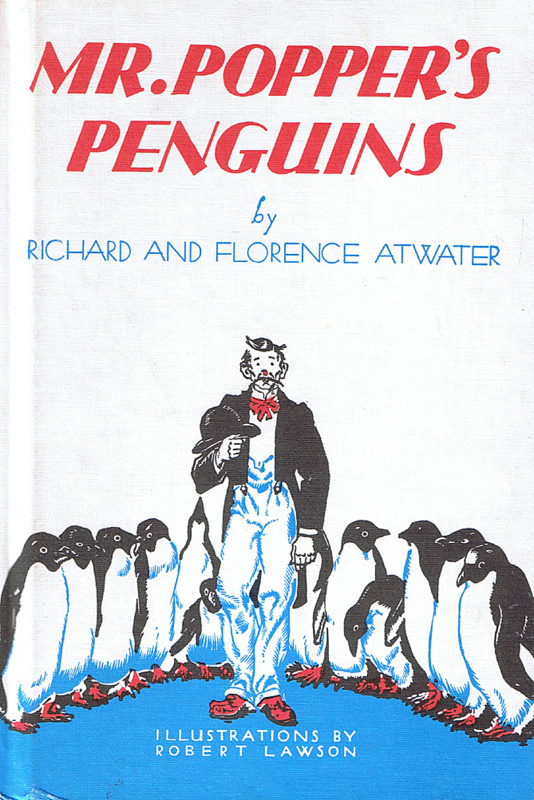 The illustrations in those books are detailed and accurate, as well as brightly colored. 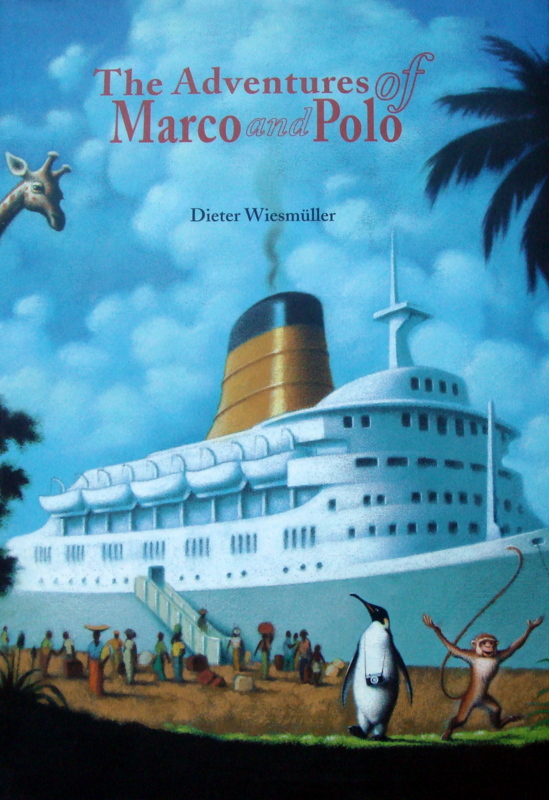 The illustrations in this book are richer than his usual style; though they evoke the same joyous feelings that all his books share. The palette changes with the seasons and is always luminous. Each page is a work of art. And you get to experience the year of a young, frolicking bunny in red overalls! 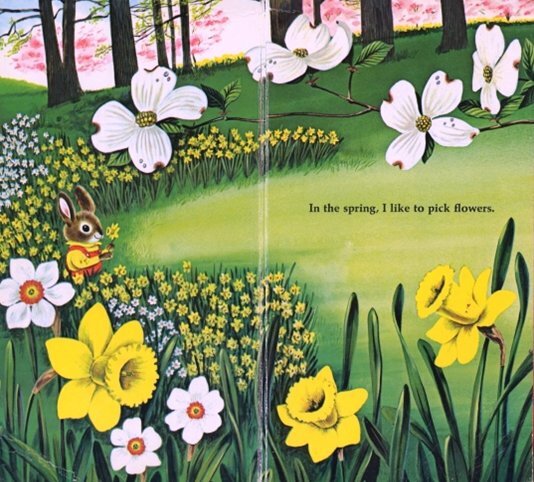 Thus begins the perfectly simple story, which follows Nicholas the bunny through each of the four seasons. In the spring he likes to pick flowers and chase butterflies. In the summer he likes to lie in the sun and watch the birds. In the fall he watches the leaves fall from the trees. In the winter he likes to watch the snow falling (me too!). 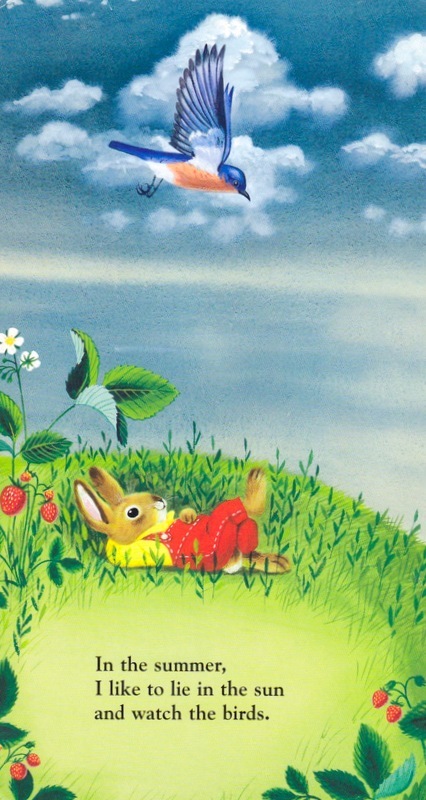 I am a Bunny should be one of many Richard Scarry books in every young reader’s collection.